Your chance to drive a Mercedes SLS AMG with BeoSound AMG Sound System | What Hi-Fi? Bang & Olufsen is in cahoots with Mercedes-Benz and has supplied the latest SLS AMG with a customised BeoSound AMG sound system – and you can win your own test drive. Based on the Bang & Olufsen philosophy, the BeoSound AMG delivers a whopping 1000 watts through 11 speaker channels with the aim of delivering true, high-end audio. You can decide for yourself with the latest competition from B&O. 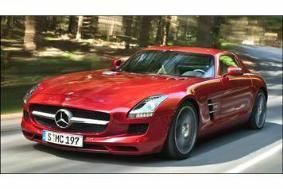 You'l be accompanied by a professional as you drive the car and visit two Mercedes factories in Germany. The prize package includes a two-night luxury stay at the ARCOTEL Camino in Stuttgart, including use of the hotel's facilities, and dinner for two in the Weissenhof restaurant. To find out more about the car, the sound system and the competition, head over to the Bang & Olufsen website.